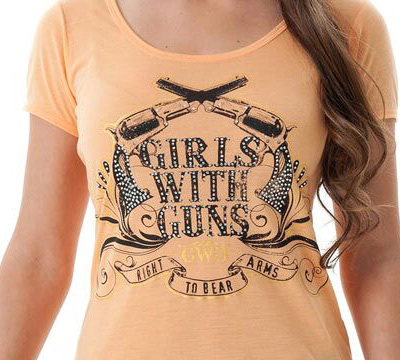 Channel your inner gunslinger in the Crossing Pistols Tee from Girls with Guns® Clothing Featuring a high-low hemline, an attractive scoop neck, and foil and rhinestone embellishments, this day-to-night tee is sure to stop 'em dead in their tracks! 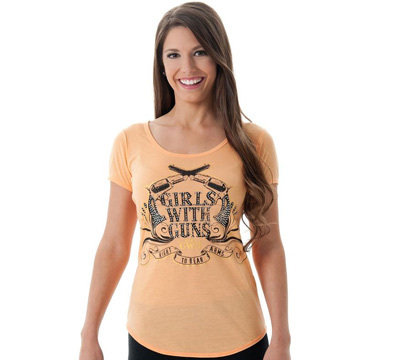 Features include: Crossing Pistols Screened Logo with Stone and Foil Embellishment, high/low hemline, Crossing Pistol Tee in Apricot, Material - Burnout, 50/50 Polyester Cotton Blend, and imported. LIMITED TO STOCK ON HAND. NO BACKORDERS.